Cloth after cloth, a brilliant white: free your clothes of greying and yellowing. The convenient HEITMANN Laundry White Cloths ensure a uniform, extremely bright white for your textiles, without any bleach. The practical HEITMANN Laundry White Cloths are added directly to the drum with your white laundry. During the wash cycle, the whitening power booster is gradually released from the cloth, which gets rid of greying and yellowing. Your clothing shines in an even, extremely bright white again. You can use the cloths for all types of fabric, with the exception of wool and silk. 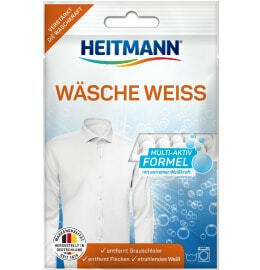 HEITMANN Laundry White Cloths are suitable for all washing temperatures and detergents. For up to 20 applications. It can’t get any easier: HEITMANN Laundry White Cloths are added directly to the drum with the laundry. Your textiles are thus restored to a brilliant white. You love soft, beautifully white laundry? Then discover the other Laundry White products from HEITMANN today. Put a maximum of two cloths in the drum with the laundry. Do not overload the washing machine. Measure out detergent as usual and start preferred wash programme. Simply dispose of used cloths in the household waste. The active substance bound to the cloths makes them appear yellowish before use. During the application, however, the active substance is completely dissolved and leaves no residue whatsoever on white textiles. Not suitable for wool or silk. Avoid overloading the washing machine—do not use for furniture coverings. Note: The UVA and UVB sun protection filters contained in sunscreens can cause yellowish stains on white textiles, which are often only visible after the textile is washed. These yellowish stains are not caused by the use of HEITMANN Laundry White Cloths and cannot be removed by the cloths.